Yesterday was a beautiful day, which luckily coincided with PE day. Before we started I had to say to my class. "If the ball goes over the hedge and into the field you are NOT to go after it. 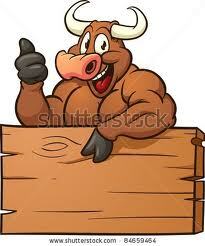 Farmer Flynn has just put out the bull and he's wicked". "Miss! I'm telling Farmer Flynn what you said about him!"